Jaqueline Lukowski is a longtime resident of the Pacific Northwest and currently lives in Vancouver, Washington. Although she has drawn and painted for as long as she can remember, it was only after having a career and raising a family that she began to pursue her love of art and in particular, landscape painting. She paints “en plein aire” as often as the weather allows, sometimes using those field studies as references for larger studio works. She usually paints in oils, but sometimes in watermedia including acrylics and gouache. She has won a number of awards for her work and is a member of the American Impressionists Society. Jaqueline regularly travels and paints throughout the western states. Several years ago she spent over 2 months painting her way across America – from Oregon to New York, along the eastern seaboard, then back across the south and southwest and up the California coast. She has studied drawing, painting, design and photography at Lane Community College and has continued her art education through workshops and lessons from nationally known artists that include Jeanne Dobie, Carla O’Connor, Frank LaLumia, Gene Costanza and Jill Carver. In 2012, her painting “Wetlands Forest” won 2nd Place at the Expressions West Juried Exhibition at the Coos Art Museum, Coos Bay, Oregon. 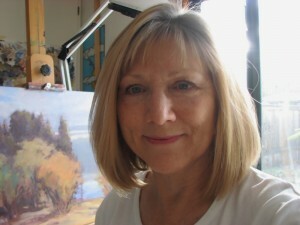 Jaqueline has participated in the Pacific Northwest Plein Air Exhibition and Paint Out in Hood River, Oregon. She has had work in the American Impressionists Society National Juried Exhibition and in the American Impressionists Society Small Works Showcase. She currently shows her work at Vistra Framing and Gallery in Eugene, Oregon.